The Piedmont region of Italy is home to one of the world's most beautiful red wines—along with hilltop castles, extraordinary restaurants and valleys full of vines. Time to drink it all in. With its fresh pasta and long-aged salumi, its forests full of truffles and, of course, its fragrant, intense wine from the great Nebbiolo grape, Piedmont is a foodie fantasyland. The region, nestled between the Ligurian coast and the Alps, is vast, so for a quick trip we suggest sticking to the famed Barolo zone, which starts just southwest of Alba. Fly into Turin, the closest airport (about an hour away), or Milan, two hours northeast, then rent a zippy car with good handling, because Piedmont’s roads are steep and winding—a.k.a. great fun to drive. Your first stop is Ceretto, a powerhouse not just of vino but also of art and design. Call ahead to reserve a guided tour and tasting at the Monsordo Bernardina estate filled inside and out with modernist pieces. Make sure to visit l’Acino (The Grape), a transparent glass orb cantilevered over the hillside, for a stunning 360-degree view of the estate’s vineyards. ceretto.com. Piedmont’s signature pasta pillows are similar to tortellini but more delicate and diminutive. The finest come from the hand of Ugo Alciati, who learned from his legendary mother, Lidia—affectionately known as the Agnolotti Queen—at the family restaurant, Guido. Settle into a seat in the restaurant’s palatial villa (on the same property as one of the area’s most important wineries, Fontanafredda) and open a lively bottle of Barbera, the everyday alternative to Barolo. guidoristorante.it. After lunch, stroll the spectacular Fontanafredda estate, especially the pastoral Bosco dei Pensieri, or Wood of Thoughts. The property, now co-owned by Alba-born king-of-industry Oscar Farinetti, the founder of Eataly, is anchored by regal orange-and-yellow-striped buildings within the contours of forest and vineyard. End your walk at the bustling tasting bar, where you can try the aromatic 2012 Fontanafredda Barolo, then hit the adjacent gourmet shop and browse Eataly-curated artisanal goods like local tartufata (truffle-mushroom salsa). fontanafredda.it. Locals flock to sleepy Serralunga because of cheerful, bearded Alessio Cighetti and his Vinoteca Centro Storico wine bar. This tiny spot is home away from home for many Piedmontese winemakers. Why? Champagne: Cighetti’s list is better than almost anything you’d find in France. He’s also a connoisseur of prosciutto, which he will carve for you himself, straight off the leg. So make like a winery worker and enjoy a cold bottle of bubbly with a plate of 60-month prosciutto. Via Roma 6, Serralunga d’Alba. After a 20-minute drive over the crest of the vine-strewn hills, you’ll find yourself in the medieval town Monforte d’Alba. Check into Le Case della Saracca, a stunning B&B, restaurant and wine bar in an ancient building literally carved into the limestone cliff. Order an aperitivo here before dinner or enjoy a nightcap after. Or both. Rooms from $161; saracca.com. At Trattoria della Posta, a Monforte fixture located among the vines since 1875, sit outside on the spacious porch and enjoy the warm Piedmontese evening as the sun sets. As for dinner, chef Gianfranco Massolino has a particular gift for anything involving mushrooms. Ask if there are any special funghi on the menu—porcini, for instance—and order them, especially if they accompany braised rabbit or veal chops. trattoriadellaposta.it. Drive the short road into the town of Barolo, a small but stately village that you can walk across in 15 minutes. Head straight to Dal Forno dei Fratelli Cravero, a family-run bakery specializing in grissini, the hand-stretched, airy breadsticks of Piedmont. Delicate wands of crispy goodness, they are made from local organic flour from the Sobrino Mill in La Morra and flavored with olives, pepper or rosemary. But don’t leave without delving into the hazelnut cakes, too—they’re revered in Piedmont, and the rich, moist versions sold at Cravero are the best. Buy some biscotti as well and try them both with a coffee under the arbors at nearby Antico Caffé. grissinicravero.com. 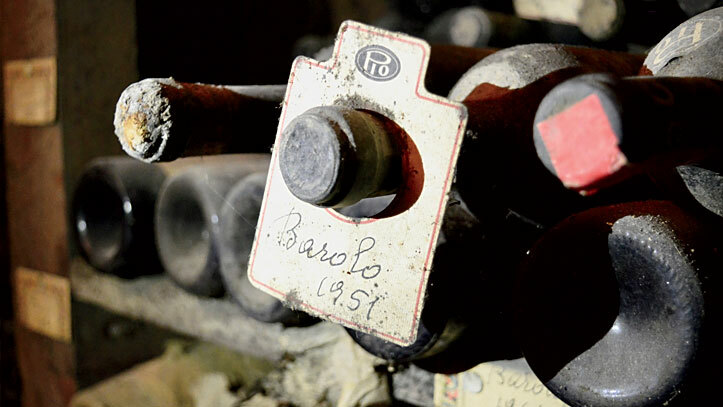 One of the rare pleasures of Barolo wine is its ability to age, its youthful fruit giving way to a heavenly perfume of cherries and roses. It’s not always easy to taste older wines in Piedmont because most producers have neither the space nor the resources to hold back bottles. One exception is Borgogno. Founded in 1761, it’s one of Piedmont’s oldest houses. Skip the tour and go straight to the tasting room to try older vintages going back decades. Then take your glass to the rooftop terrace and soak up the sun and the bella vista. borgogno.com. A five-mile drive along a series of ascending hairpin turns gets you to La Morra, the highest of all the Barolo villages. Lunch at Bovio Ristorante is a must, partly thanks to the views of the hills from the outdoor terrace. Start with a local specialty of battuta (veal tartare), then take advantage of Bovio’s diverse wine list by ordering a light red from one of Piedmont’s delicious but lesser-known grape varieties, like Fratelli Alessandria’s aromatic 2015 Verduno Pelaverga Speziale. ristorantebovio.it. Piedmont’s soul is its small, artisanal winemakers, and visiting one is imperative (but be sure to make an appointment well in advance). Azienda Agricola Elvio Cogno, a tiny producer in Novello, about 15 minutes from La Morra, is among the best. Elvio’s daughter Nadia and son-in-law Valter, the winemaker, run the estate. You’ll visit the old farmhouse that serves as both cellar and residence, and taste their magnificent Barolos as well as some delicious curiosities, like the 2015 Nascetta, a local white grape with a floral aroma that Elvio and Valter helped save from extinction. But most of all, you’ll hear stories from the people behind this very special place. elviocogno.com. Pull into Alba just when the shops are starting to hum again after their afternoon riposo. This is a city for strolling, and pedestrians fill the streets in the hours before dinner. Swing by Golosi di Salute (Gluttons for Health, Piazza Michele Ferrero 11) to pick up some treats from superstar pastry chef Luca Montersino. A jar of his gianduja (chocolate and hazelnut cream—the original Nutella) deserves a corner of your suitcase. Next, swing by the truffle shop Tartufi Ponzio. White truffle season isn’t till the fall, but the earthier, more affordable black summer truffles are ripe for the shaving, and Ponzio’s exquisite truffle pâtés, butters and honeys are great year-round. tartufiponzio.com. It’s aperitivo o’clock, so order a Campari and soda at Caffè Umberto on Piazza Michele Ferrero and grab a seat on the square. When you’re ready for dinner, head down the stairs to Umberto’s sister restaurant, Enoclub, in a cozy brick-lined vault. As the name suggests, Enoclub has a serious wine list, but the main draw is its perfect rendition of another Piedmontese classic: hand-cut tajarin, gossamer noodles made with 30 egg yolks. This melt-in-your-mouth pasta is the ideal delivery device for a ragù, truffles, or just butter and sage. caffeumberto.it. Save room after dinner for a scoop of intensely flavorful pesto di pistachio gelato at La Romana, just a short walk from the restaurant (gelateriaromana.com). Then saunter 10 minutes over to the stately Palazzo Finati for the night. With its Persian rugs, traditional furnishings and paintings by local artists, this nine-room boutique hotel has a nostalgic fin de siècle vibe, though the accommodations are spacious and have modern conveniences (e.g., free Wi-Fi). In the morning you’ll find yourself in the center of old Alba with a choice: Now that you’ve seen Barolo, shouldn’t you head north to Barbaresco? Rooms from $163; palazzofinati.it.